Squeeze the highlights of Borneo into an adventurous 2-week itinerary. Explore the last stronghold of Bornean primary rainforest – the real jungle – in Danum Valley, make a record in orangutan spotting on tranquil river cruises along Kinabatangan, unwind on a secluded paradise island snorkeling with turtles, visit orangutan sanctuaries, and indulge in Bornean cuisine and cultural treats in the charming cities. Along the way, you can choose between world-class hiking, snorkeling, and wildlife spotting – or just opt to sit back and enjoy the sceneries. This two-week route maximizes the chances to find funny-looking proboscis monkeys, orangutans and rare Borneo pygmy elephants in the wild – astonishingly, we saw the latter three times! The pace is laid-back, so following this 2-week itinerary will set you to relaxed vacation mode. But at the same time, you’ll pack in a lot in terms of truly experiencing all the different flavors of Borneo. Let’s take off! Sepilok is a perfect spot to start your journey, as it allows you to avoid starting and ending your trip in Kota Kinabalu. When time is short, every night counts! Internal flight from Kota Kinabalu (where your international flight lands) to a nearby coastal city of Sandakan takes just 45 minutes, and from there it’s less than 30 minutes’ taxi drive to Sepilok. But why Sepilok? Choose a resort that is tucked away from it all and a room facing the rainforest and sleep away your jetlag. Wake up to the sounds of exotic birds and enjoy breakfast outdoors while spotting monkeys in the trees. Then head to the world-famous orangutan sanctuary to witness semi-wild red-furred cousins swinging to the feeding platforms for their lunch. Still not completely charged up? 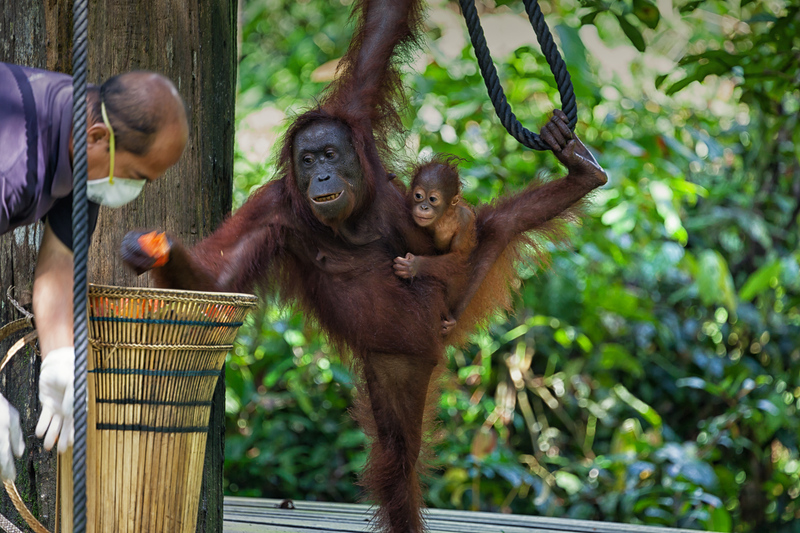 What about visiting orangutan nursery and watching babies wrestling and chasing each other? 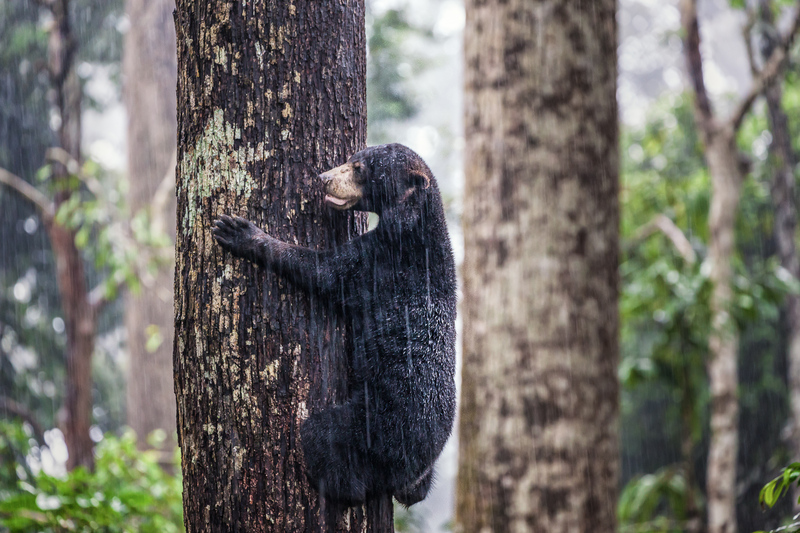 Still, the highlight for us was visiting Bornean Sun Bear Conservation Centre, where you can watch the pint-sized bears climbing up the trees and minding their own businesses. We also loved the nature walks in the rainforest, on the elevated platforms just behind our hotel, MY Nature Resort. The additional perks included watching giant red flying squirrels glide upon us during the evenings. In Sepilok, you’ll get a perfect foretaste of Borneo – the orangutans, sun bears, and rainforest – in just one day! Get inspired and read our separate article: 5 Things To Do In Sepilok! If you have only one week or less in Borneo, check out shorter Sabah itineraries here! There are multiple daily flights between Kota Kinabalu and Sandakan. One-way prices start at 13$ (AirAsia), so there’s absolutely no reason to take the road. That’s also a total bargain for the one most scenic aerial views: you’ll be flying past Mt. Kinabatangan and weather-permitting the peak is fully visible. Be sure to book left side seat from Kota Kinabalu to Sandakan! Taxi drive from Sepilok to Sandakan takes less than 30 minutes. It’s worthwhile to check if your hotel offers return transfers – ours did. I wouldn’t bother thinking about the bus. Local buses leave hourly from ´Batu 14´, by the highway (Sepilok doesn’t have a center, so you’d need a taxi to Batu 14). Spend a day in the authentic Bornean small-town vibes mingling with locals. Zigzag between the hawker and fruit stalls of Sandakan Central Market and stock on everything you’d possibly need from the nearby Harbour Mall, which alone would be a justifiable reason to spend a night in Sandakan before heading off the grid. We enjoyed a great lunch at a quaint café, lovely rooftop drinks, and authentic Malay dinner at the waterfront with locals. Sandakan offered us a welcome city break before spending a week in the remote corners of Borneo! Use either a taxi or bus – or ask the transfer from your hotel, as specified above (check out “Getting to Sepilok”). 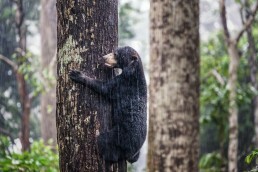 A Bornean Sun Bear climbing to a tree in the rain in BSBCC, Sabah, Malaysia. Welcome to the paradise! Lankayan Island is straight out of the tropical daydream: a tiny jewel-shaped, coral-ringed island far off the coast and crowds, in the turquoise Sulu Sea. Imagine chalk-white sand beaches and a magical underwater world, which bewitches divers and snorkelers alike. Then add an exquisite luxury resort, with just 26 seafront chalets, all facing the endless, turquoise ocean. 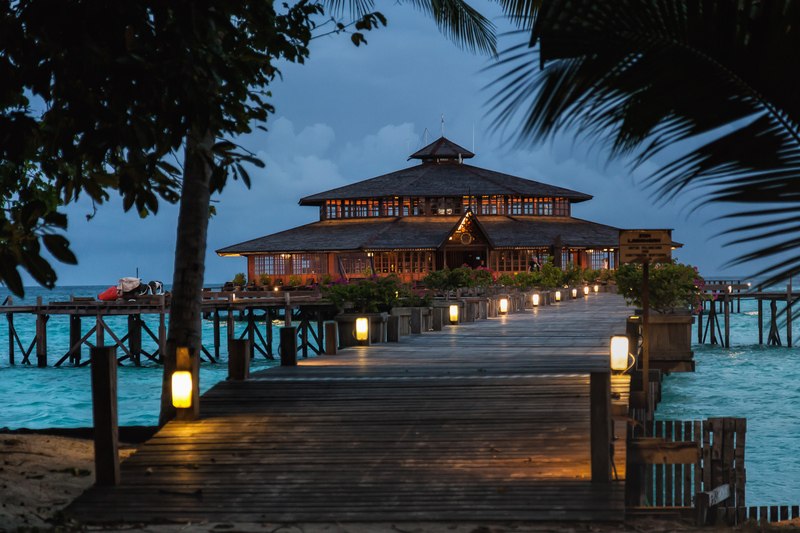 This uninhabited island offers ultimate seclusion – a perfect spot for romantic getaways. Just look at the pictures, the words are not enough. The best thing is that you don’t need to be a diver to see rare creatures, like jawfish, explore colorful coral reefs, and swim with turtles or sharks. You can do it all in the shallow waters of the Lankayan jetty, even if you’ve never snorkeled before. We searched long and hard for the best place to snorkel in Borneo – and found it from Lankayan. Check out our separate article about the magical underwater world of Lankayan! Private boat transfer (included in the rates of Lankayan Island Dive Resort) leaves Sandakan at 10 AM and leaves Lankayan at 7 AM, so plan your itinerary accordingly. If you’re flying in Sandakan, note that your flight has to land before 9 AM. Kinabatangan River is the best bet to see wild orangutans in Borneo – the sightings could be almost guaranteed if you stay two nights at the river (our guides said that the likelihood is 70%). 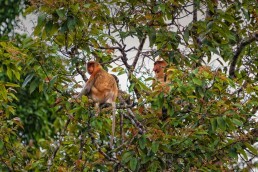 Proboscis monkeys are omnipresent and nearly impossible to miss, still watching their plump bellies and funny noses will guarantee smiles at every encounter. What we couldn’t believe was spotting a herd of endangered Borneo pygmy elephants. There are only 1500 of these baby-faced forest elephants left in the world, as their population has dropped by 50% during the last three generations. It’s incredibly hard to pick the highlight of our Kinabatangan adventure: every moment spent watching wild orangutans and proboscis monkeys felt sacred, and we were up in the clouds while trying to spot the massive gray ears and trunks of those pygmy elephants through reeds. Still, all river cruises felt serene, though during one morning we didn’t spot any orangutans, and I enjoyed jungle breakfast with cheeky macaques and wild pigs. Kinabatangan River attracts loads of tourists, so pick your lodge wisely. I’d recommend spending at least one night upriver, far from the cluster of lodges in Sukau village, where riverboat traffic disrupts the jungle fantasies. We loved the privacy of the Abai area combined with one night in Sukau, where wildlife spotting was excellent. Get more inspiration for your trip from our separate article on Kinabatangan River! One word of warning for Kinabatangan River: there is a devastating reason for the massive numbers of orangutans and other wildlife. The palm oil industry has left only a narrow corridor of the jungle for animals to move around. As splendid as it feels to visit Kinabatangan, it isn’t a real, untouched wilderness – and that’s the perfect reason to venture deeper and add our next destination into your itinerary! Either book a tour beforehand or negotiate with the tour operators in Sandakan. Some of the lodges also allow straight bookings (though many are owned by tour companies), but you’ll need river transports anyway. Sukau village is also reachable by car, but we’d recommend venturing further for more authentic Kinabatangan experience. We recommend a tour as then all transports and activities are included – and even the transits become exciting chances to spot wild orangutans and proboscis monkeys! 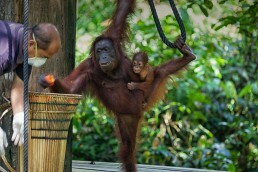 Want To See Wild Orangutans? 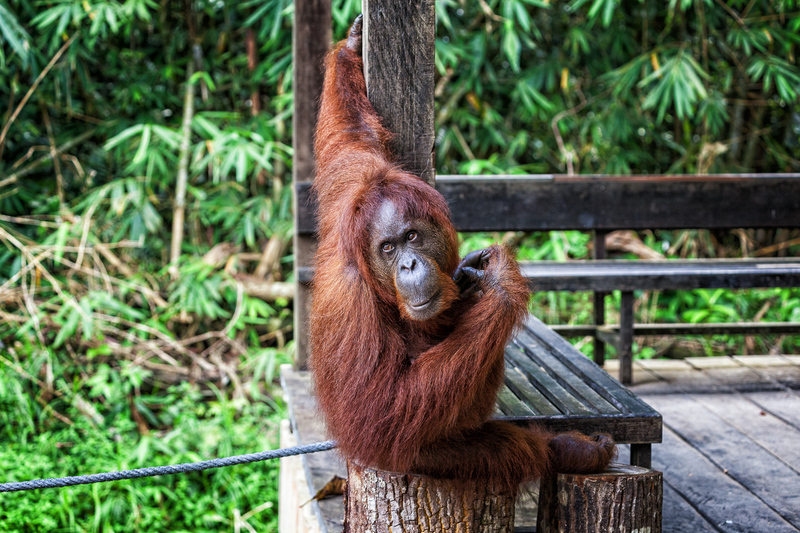 Check out the best places in Borneo to see orangutans in the wild! We also give tips on how to behave near orangutans and which are the best places to photograph them! If I’d have to pick only one destination in Malaysian Borneo, it would be Danum Valley. It’s the last stronghold of primary rainforest in Borneo, where you can hike along marked trails gazing to the immense, untouched jungle where no man has set foot. Danum Valley is a naturalist’s paradise: before these 438 square kilometers of lowland dipterocarp forest was declared a conservation area, there were no human settlements, meaning no hunting or other interference with wildlife. More than 340 species of birds and 124 species of mammals call this their home – count in orangutans and Borneo pygmy elephants, both of which we were lucky to see more than once. There’s only one lodge inside the Danum Valley Conservation Area, boasting ultimate seclusion and luxury. 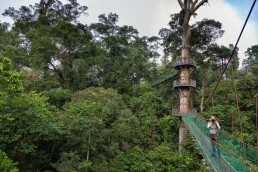 The award-winning Borneo Rainforest Lodge offers a gateway to the real jungle of Borneo on its private hiking trails inside the conservation area, along with the iconic, 300 meters long treetop canopy walkway, open exclusively to the guests. All-inclusive rates cover exciting activities – choose between nature walks with a naturalist guide, fun river tubing, longer hikes, birding, and night drives. Check our separate article on Danum Valley and get inspired! All-inclusive rates of Borneo Rainforest Lodge include 2-hour transfer from the town of Lahad Datu. MasWings has several daily flights from Kota Kinabalu to Lahad Datu. If you’re coming from Kinabatangan, ground transport is the quickest option (appr. 1-1,5 hours from Sukau to Lahad Datu). Either your lodge in Kinabatangan or Borneo Nature Lodge can organize the transfer. After exploring the Sabah area for more than a week now, venture into another side of Malaysian Borneo: Sarawak. 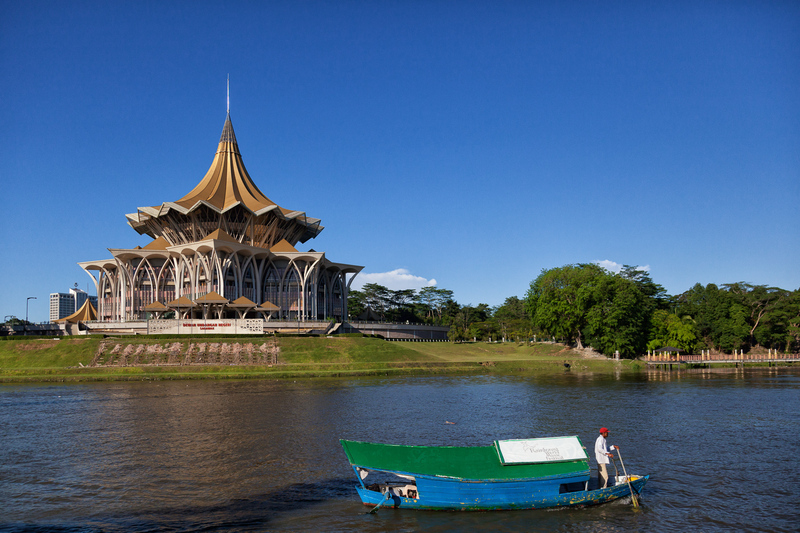 Kuching offers a convenient – and exciting – shortcut to the vast Sarawak. The city itself needs to be felt: roam the riverfront and the colorful streets of Old China Town with locals, pop in the acclaimed fusion restaurants and local eateries and eat your way through the highland and tribal cuisines. Check out a separate foodie guide for the best restaurants in Kuching! The day trips are the draw of Kuching: you can visit even the far-flung corners of Sarawak on a day trip from Kuching. The hardest part is to choose between the several options and still leave enough time to feel the beat of Kuching. We visited Bako National Park and Semenggoh Nature Reserve – both spellbinding in their own way. For us, the encounters with semi-wild orangutans in Semenggoh Wildlife Center felt more personal and special than in Sepilok, as the orangutan sanctuary is both smaller and less visited. Bako National Park offers unbelievable versatile trails for short and long day hikes. The sceneries are otherworldly: think of untamed jungle beaches where bearded pigs grub sand and thick forest where proboscis monkeys play upon you. The vegetation is an incredibly versatile with seven different eco-systems – from mangrove to majestic cliffs and weird rock formations, swamp to mixed dipterocarp forest and keranga (a heath forest with acidic, sandy soil). Cheap internal flights carry you conveniently almost from the furthest fringe of Sabah to the capital of Sarawak. Driving would be insane (more than 1500 kilometers), as the flights take just a couple of hours. We flew with Mas Wings from Lahad Datu to Kota Kinabalu: they have four daily flights with promo prices around 25$. To Kota Kinabalu–Kuching leg AirAsia proved to be a cheaper option. Kota Kinabalu entertained us only for one evening, but feel free to expand your stay. We enjoyed our sunset walk along the waterfront with locals, popping in the bustling – and endless – street food market. Somehow one night still felt enough for us: after the jewels of Borneo, Kota Kinabalu felt rather chaotic and dirty. Some find it a pleasant base for daytripping the nearby islands, but after Lankayan – or Semporna islands – you won’t find paradise here. The others end or start their holiday at the nearby beach resorts, but our research drove us to ponder between Semporna Islands and Sandakan Islands (Lankayan). The Kudat area on the tip of Sabah (accessible via Kota Kinabalu by road) sounds perfect for a budget beach stay. If you long for a more tranquil beat and have more time to spend, I’d suggest adding more days on Lankayan Island (especially if you’re a diver or avid snorkeler) and Danum Valley (especially if you’re into hiking). If you have only 7 to 10 days to spend, I’d drop visiting Kuching (Sarawak) and narrow down the nights in Sepilok/Sandakan area. We were exceptionally pleased with this 2-week itinerary, so personally, I wouldn’t remove or add anything – other than more time to explore more destinations. I’d happily add extra loops for climbing Mt Kinabalu (we will return for that! ), visiting Maliau Basin National Park in Sabah and doing more day-trips from Kuching to the rest of Sarawak (Gunung Mulu caves, river cruises, Kelabit Highlands, and the longhouses of the headhunter tribe). And of course, we will return for the vast Indonesian side of Borneo called Kalimantan – there’s a lot the explore! If this 2-week Borneo itinerary gets you going, be sure to check our favorite lodges around the Malaysian Borneo to get out the most of your stay! We handpicked four luxurious lodges, which will give you to a real taste of Borneo with all the modern comforts, sumptuous dinners, and authentic wildlife encounters. Check out our list of the best lodges in Malaysian Borneo! 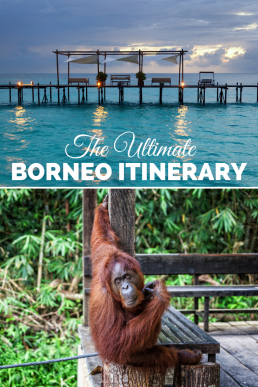 Excited and ready to book your trip to Borneo? 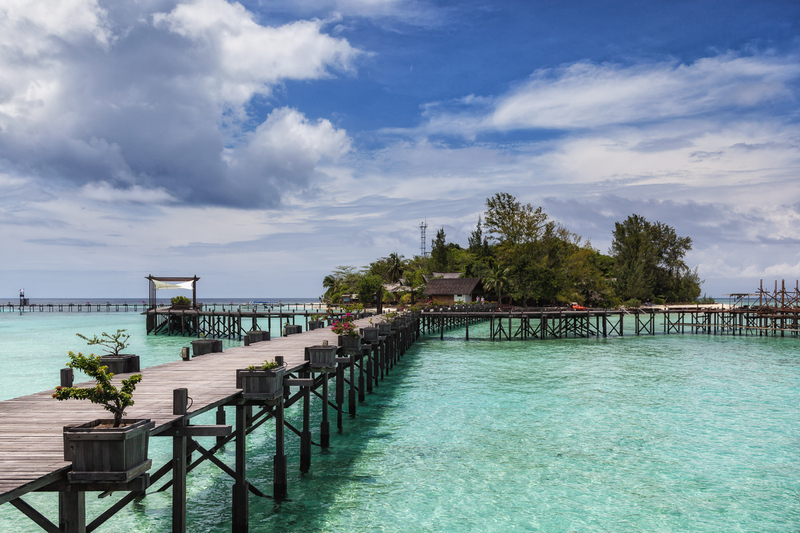 Would you follow our steps tracking the beat of Borneo on this 2-week itinerary? 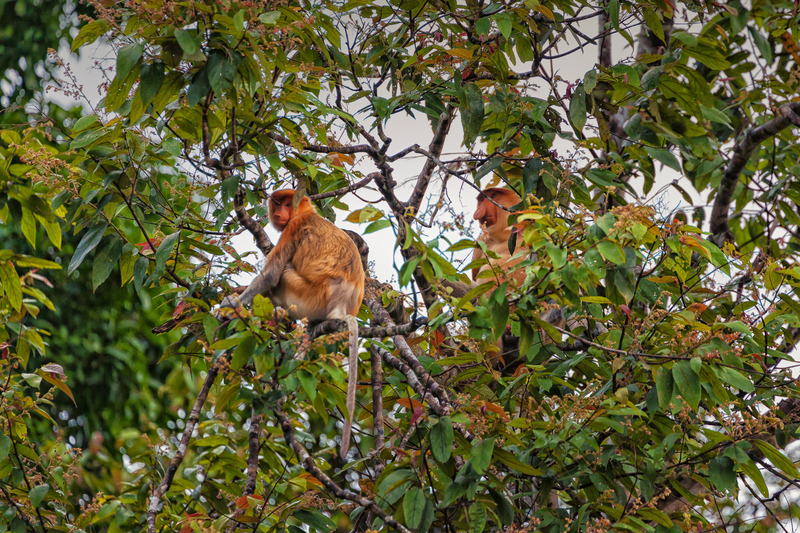 If you’ve visited Malaysian Borneo, what were the highlights for you and would you change something in our itinerary? Sadly we will have less than 2 weeks more like 10 days.I’m just checking out accommodation in Kota Kinabalu for the end of our trip – generally it’s not a problem but I’m struggling !! Any suggestions for an itinerary would be helpful. This will be a long answer. I’d stay only one night in Kota Kinabalu – it’s not that exciting place, and the hotels are rather dull. We stayed in Grandis: it was no frills kind of hotel, claims to be 4-star, but I’d say more like 3-star. The deal that we got from booking.com was affordable, the location is good, the rooms clean and do the job if you’re just sleeping there. If you’d like to invest a little more (double the price), I’d probably pick Shangri-La’s Tanjung Aru Resort & Spa, although Shangri-La is 4,5 kilometers away from the center. It really depends on what you’re planning to do in Kota Kinabalu. Ultimately, I’d pick Shangri-La for 2-3-day stay (enough time to relax and explore the city and nearby islands if that’s what you’re looking for) and any of the solid 4-star hotels in KK for a quick 1-night stay (better location for walking around Kota Kinabalu and experiencing the city). As to 10-day itinerary, I’d definitely pick Lankayan Island (it would be the highlight for your girls!) and Kinabatangan River. 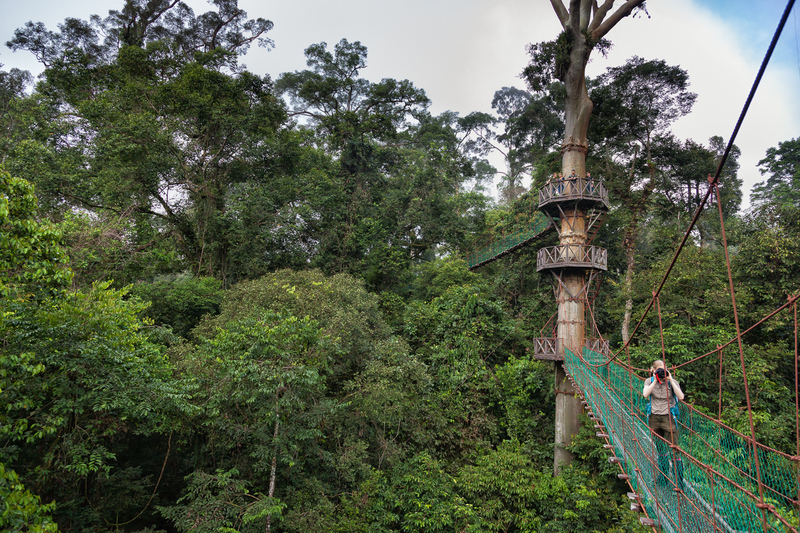 Another highlight would be Danum Valley (although it’s pricey): it’s super fun for the girls with all the activities (tubing in Danum River, canopy walkway, mini hikes in the rainforest, swimming and of course wildlife spotting). I’d go basically with our 2-week itinerary, but I’d drop out Kuching, so you would be based in Sabah. You can also trade Danum Valley to Kuching and it’s still a perfect itinerary, then you could also fly out from Kuching. 3 nights in Danum Valley (if you can squeeze it in). If the itinerary feels too rushed, expand the other stays according to your preferences and stay the last night in Kota Kinabalu. Please let me know if you have any further questions. If you’d like to us to plan the route for you in details, we offer itinerary planning at a small charge. Borneo is so versatile that I’d definitely pick it for your family vacation. You cannot find better wildlife watching from other Asian countries and snorkeling is unique. As much as we love Cambodia, the beaches there aren’t that good. Cambodian holiday would focus more on temples and history. Borneo Rainforest Lodge (our pick for accommodation in Danum Valley) is also listed among the best wildlife lodges in Asia. Seeing orangutans in the wild is among the highlight of our travels – you cannot really compare it to anything else (we’ve also been gorilla trekking and chimp trekking in Uganda but that’s a different story). 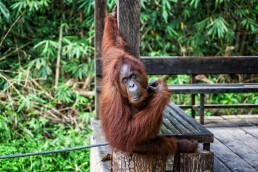 Also orangutan sanctuary visits in Borneo are special (Sepilok & Kuching). We just published a separate article on spotting orangutans, you might want to check it out. 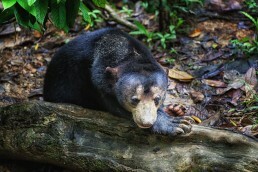 Please consider booking your hotels stays in Borneo through our booking.com affiliate link http://www.booking.com/index.html?aid=1132006 (also links to other booking sites are found on Travel Resources page, on our site’s top navigation): we would receive a small commission without any extra charge for you. Thank you so much for your support. They love animals and the beach !! 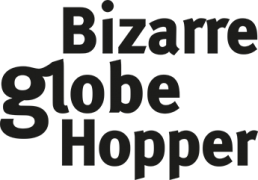 Could you suggest a good plan – I’m getting more confused the more I research ! Hi Kathryn! How many days do you have in Borneo? I’m just about to publish another article for shorter itineraries (one week or less). If you do have 2 weeks, I’d go with this itinerary, as it has a perfect mix of wildlife and beach time and snorkeling/diving. All these areas are also fun for kids and safe for now (2019). If you have more than 2 weeks in Borneo, I’m happy to give you further suggestions! We hope to leave the UK 15th December and fly home 24th December – thought this might help in addition to my previous message.Apart from Borneo I thought of maybe Laos or Cambodia. Your itinerary is amazing! I have checked out the SI tour website and considering the LOWER KINABATANGAN RIVER & DANUM VALLEY tour. https://sitoursborneo.com/web/mysia16/ is this the tour that you did with SI or did you get a tailored package? Hi Tania! Thanks so much, we loved our every minute in Borneo! We were with SI Tours only in Kinabatangan: the first night in Abai and the second night in Sukau. 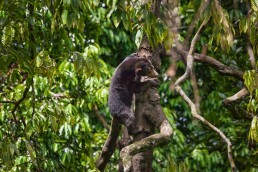 We visited Danum Valley with Borneo Nature Tours, who owns Borneo Rainforest Lodge. But you can add Danum Valley also to your itinerary with SI Tours 🙂 I’m sure it will be an epic trip! Oh, awesome post! Reading your post reminds me of the amazing nature in Kota Kinabalu. I see that the everything there is preserved very well. Thanks so much for sharing your experience! Thanks so much! Glad to hear that you enjoyed visiting Kota Kinabalu. Did you also do further exploration around Malaysian Borneo? If so, I’m curious to hear what were the highlights for you? Hi Abbie! And thanks for tuning in. Seeing orangutans in the wild was also our dream – you’ll absolutely love Borneo! If you know your exact dates and happen to travel during school holidays, I’d book well in advance. We booked every lodge just a couple of months in advance, so we were super lucky to get the very last room from Borneo Rainforest Lodge (but we had to reorganize our itinerary to fit into their vacancy). So please book several months in advance, no matter your timing! You won’t be disappointed in Borneo Rainforest Lodge: it’s so worth the splurge! The daily activities with your own guide are so versatile and offer profound insight into the wilderness. It’s such a divine place! 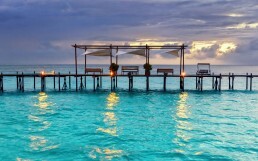 I’d book directly with them, though you can also book through travel agents. Please let us know if you have any further questions. Happy planning! 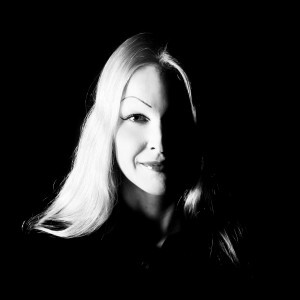 Really great article! thanks for the tips. Any recommendations for a tour company to book the Sungai Kinabatangan River segment through? thanks! Hi Joey! Thanks for reading. We explored Kinabatangan River with SI Tours and were extremely pleased with their guides and the location of the lodges. We loved Abai area for its tranquility and Sukau area for spotting even more orangutans and seeing the rare pygmy elephants. I’d recommend staying at least one night in the both areas. SI Tours owns Abai Jungle Lodge in Abai and Kinabatangan Riverside Lodge in Sukau. 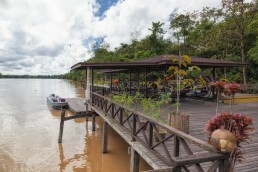 Piritta also wrote a separate article on Kinabatangan River, you can read it here: https://www.bizarreglobehopper.com/blog/2017/07/12/kinabatangan-river-cruise-malaysian-borneo Please let us know if you have any questions. Enjoy Borneo!  Hey there – your trip looks amazing and thanks for the really useful article. I’m thinking of doing the trip myself in July – do you have a rough total spend for the trip? Whereabouts did you fly from? Hi Andrew! Congrats on your trip, it’ll be awesome! The majority of the budget in this kind of tour goes into all-inclusive accommodation (Danum Valley/Borneo Rainforest Lodge, Lankayan Island/Lankayan Island Dive Resort, Kinabatangan River & Sepilok/SI Tours; between 230$-1200$ per person per day). But then again, it’s all inclusive in the best possible sense: all fantastic wildlife tours and meals are catered. The prices also include transfers from the nearest airport (Lahad Datu for Danum Valley, Sandakan for Sepilok/Kinabatangan and Lankayan). In the cities of Kota Kinabalu and Kuching, we stayed in “normal but nice hotels” and ate out; there our daily budget varied between 50$ to 100$ per person. Internal flights were cheap (we used AirAsia and Mas Wings), the cheapest promo prices at the time were 13$ for Kota Kinabalu-Sepilok leg, 25$ for Lahad Datu-Kota Kinabalu and about the same for Kota Kinabalu-Kuching leg. I’d recommend checking AirAsia for the cheapest fares and Booking.com for hotels in Kuching, Kota Kinabalu and possibly Sandakan (we stayed there one night, as well). 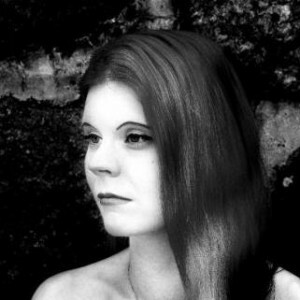 If you use Booking.com, please consider using our affiliate link: http://www.booking.com/index.html?aid=1132006 – there’s no extra cost for you, but we’ll get a small provision that fuels this blog. What a fantastic adventure. I’m very envious. Yet to make it to that quite that far east but hopefully one day…. Great itinerary. We’re thinking of heading to Borneo this fall, so it’s nice to see an overview like this of all the tops spots. We have a little longer to spend, so we might indeed take the road instead of flying. We prefer the road to flying even when it’s more expensive / inconvenient because flying for such short distances is terrible for the environment. Also, if you’re on the ground, you get to experience more of the country you’re in! So there are great reasons to take the road, even if a flight is only $13! Hi, Jane! Thanks for reading. I really appreciate your view and totally agree with the ecological print. Plus, Pan-Borneo Highway and comfortable tourist buses make road travel easy. But when you are short on time and road takes 10+ hours against an easy 1-hour flight, it’s hard to resist the temptation. In future, we hope to slow down our pace to explore deeper. Even we enjoyed our road trip from Kinabatangan to Danum Valley (whereas all the others took a boat from Kinabatangan to Sandakan and flew the legs Sandakan-Kota Kinabalu and KK-Lahad Datu, which sounds crazy). Just let us know if you have any questions about the places we visited. Happy planning and happy travels! Hi, Jen & Mina! Thanks for reading. We really loved all the spots we had a chance to stay in Borneo. Lankayan Island and Danum Valley were both exclusive, once in a lifetime kind of experiences. Lankayan is a paradise for snorkelers and divers, whereas Danum Valley is a haven for naturalists, birders, and wildlife photographers. The lodges are luxurious in both, crowning the experience. Oh, how we wish to return! Hi, Alyssa! Thanks for stopping by! We need to return to explore Sarawak: Niah and Mulu caves are on our list 😉 We saw the pygmies once in Kinabatangan, by the river bank. Our guide had heard of their presence, so we did a lot longer river safari than usual to reach them. It was so special to observe them through the grass; we’ll cherish that experience forever! The other times happened while we drove to Danum Valley: the pygmies were suddenly in the middle of the road just before us! But they took off faster than I could dig my camera bag. When we returned from Danum Valley, we saw the same herd and managed to get at least some shots with our phones. We feel so grateful for all those moments and know that we were really lucky. The place that you stayed looked so luxurious. What an amazing experience! This is a great!!! I live in Borneo myself and I’m guilty of not doing half of this list (except Kuching. I live in Miri though ☺️). I’ve only spent time in Kota Kinabalu in Sabah. Also, glad that you saw the pygmies!!! I heard they’re pretty elusive, and on certain times do people see them crossing the rivers in Kinabatangan cruise so you’re very very lucky! Your orangutan pictures are great! Hi, Jen! Thanks so much! So glad you liked my pics. I had my new L-series lens with me for the first time in Borneo. Loved to shoot with it!